Falgate is an impressive stylish detached coastal holiday home which we are delighted to offer for holiday letting. Arranged over three floors, this gorgeous seven bedroom, five bathroom house offers a wealth of spacious rooms to comfortably accommodate up to eleven guests, with beautiful far reaching sea views from the top two floors. On the ground floor there's a fabulous light and airy hand-crafted kitchen with room for twelve to dine in comfort, together with a relaxed sitting area, snug and separate sitting room. Also on this level is a superb bedroom suite which is perfect for less mobile guests. A bespoke spiral staircase leads to a further four bedrooms on the first floor and continues up to the second floor with two bedrooms. This lovely house is enviably located on a quiet lane, with a beautifully presented enclosed garden, only moments walk from the popular harbour and coastal path at Burnham Overy Staithe, and the newly refurbished "Hero" gastropub. Falgate is available at reduced rates for under occupancy outside school holiday periods. The maximum number of guests is 11. This includes infants. There is under-floor heating throughout the ground floor. Free fibre optic broadband is provided, with the advantage of a Sonos sound system and "mood lighting" throughout. Entrance hall: spacious area with travertine floor and plenty of space for coats and boots. Accessed directly from the entrance hall on the right, is a ground floor bedroom suite (bedroom 1) which would be suitable for less mobile guests, being all on one-level with easy access wet room. Bedroom 1: lovely light and spacious room with a super king-size bed (zip-linked twin beds), bedside table and lamps, built-in wardrobe with shelving and hanging space, two bedroom chairs. En-suite wet room: has a large easy access shower (no steps), hand basin, WC and a heated towel rail. Kitchen/Dining/Family room: contemporary light and airy open plan area comprising a relaxed sitting/family area, spacious dining area and stunning kitchen. Family room: has a double height vaulted ceiling with a contemporary wood burning stove, comfy leather sofa, armchair and a TV. Dining area: Has a wooden dining table which may be extended to comfortably seat twelve guests (twelve matching chairs are available). There is a partly glazed ceiling and fully extending bi-fold doors which open onto an enclosed courtyard, perfect for dining al-fresco when the weather permits! Kitchen area: Superb hand-crafted kitchen with grey painted units and marble surfaces, extremely well-equipped with a Falcon induction range cooker, integral dishwasher, integral fridge, integral freezer (3 drawer) and microwave. Cloakroom 1: hand basin and WC. Utility room: a spacious room which contains a washing machine, tumble dryer, butler sink, additional storage cupboards and a full height fridge. Wet room: accessed via the utility room is this large wet room, perfect for sailors or any wet and sandy guests! Contains a shower, hand basin, WC and a heated towel rail. Snug: charming room with a beamed ceiling, exposed brick fireplace (non-working) and a sofa - the perfect place to escape to for some peace and quiet. Cloakroom 2: another WC and hand basin. Sitting room: lovely room overlooking the front with an attractive exposed working fireplace, window seats, two large sofas and two armchairs. Large built-in cupboards either side of the fireplace, one of which contains a flat screen TV. Inner hall: has the front door (not frequently used) and a bespoke wooden spiral staircase in a nautical style with a rope bannister rail, leading to the first and second floors. Guests should be advised that whilst there are two stair-gates on the first floor, this open staircase may not be suitable for small children. Bedroom 2: lovely spacious room with stunning views out towards the sea. There are twin beds, which may be zip-linked, with two separate duvets, bedside tables and lamps, built-in wardrobes. En-suite bathroom: huge room containing a bath with shower over, hand basin, WC and heated towel rail. Bedroom 3: a large room with views towards the coast, king-size bed, bedside tables and lamps, built-in wardrobe and an armchair. Bedroom 4: a smaller room with a double bed, bedside table and lamp, chest of drawers, built-in wardrobe and a chair. Family bathroom: bath with wall-mounted shower over, square contemporary hand basin and a heated towel rail. Bedroom 5: charming room with a beamed ceiling, single bed, bedside table and lamp, chest of drawers. There is a gate leading to the enclosed spiral staircase to the top floor. Landing: stunning views towards the coast and salt marshes and two built-in cupboards for clothes storage. Bedrooms 6: Lovely master bedroom with lovely sea views. Contains twin beds, which may be zip-linked, with two separate duvets, bedside tables and lamps, built-in cupboards, chest of drawers and a chair. En-suite shower room: bath with shower over, hand basin and WC. Studio Bedroom 7: a highly versatile room with its own kitchen! 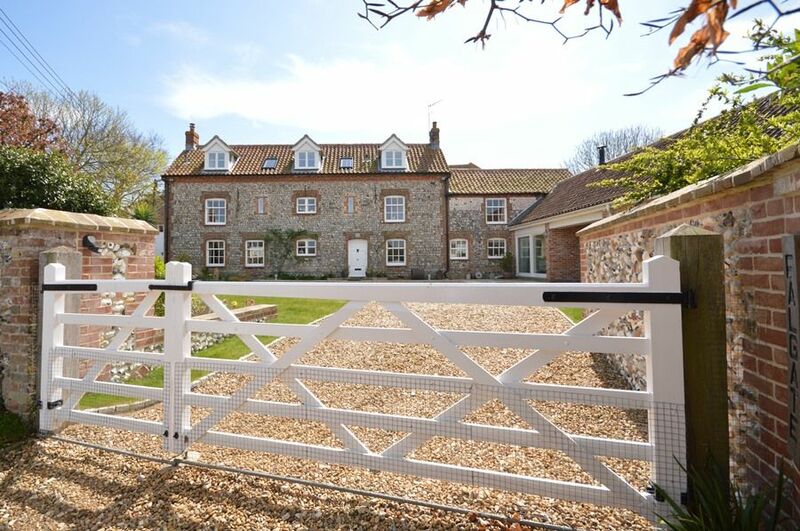 Has stunning coastal views and a port-hole window with views to the Overy windmill. Perfect for use as an office, or for an au-pair or Granny with a single bed, bedside light, large built-in desk with office chair and desk lamp. The kitchen area has an oven, hob, sink, integral fridge and a kettle. Falgate is quietly located along the highly sought after Gong Lane with entry via a private shingle drive with a large five-bar gate leading to plenty of parking space. The beautifully maintained enclosed gardens are all at the front of the house, with lawns and parking areas edged by established flower beds. There are two patio areas for outside dining and the benefit of a covered parking area. It is conveniently positioned within moments walk from the harbour and the coastal path, The Hero (an excellent gastro pub) and a large village playground with built-in play equipment, two football goals and two tennis courts (booking required in summer). The Georgian village of Burnham Market with its great selection of independent shops and galleries and the renowned Hoste Arms is just 2 miles away. Please note that although this property will not accept dogs, the owners do have one dog who stays here.